Millions of Salmon, Six Months of Serious Fishing. Is there a better place than the fraser river? For years and years anglers looking to experience world class salmon fishing have traveled to Alaska, the Skeena River and the west coast of Vancouver Island all the while flying or driving right over the Fraser river. The lower Fraser was one of the best-kept fishing secrets that many local anglers were happily enjoying all to themselves. Over the past few years this local hot spot has slowly crept out of the shadows of the other premier salmon fishing destinations to emerge as a world class angling destination all of its own! The Fraser River is over 1000 miles long, this is a very big river but not to worry the best salmon fishing is from Chilliwack to Hope approximately 50 river miles. Chilliwack is just minutes from the Canada/U.S. border, only about 80 miles east of Vancouver. This is where all the action is; on any given year between 15 to 50 million Salmon will pass through this area on their way to their spawning tributaries. Anglers looking to fish the Fraser River for the first time may be a little intimidated by this big river. The when, where's and how's on catching salmon in an environment such as this can take years to figure out. A good guide can prove invaluable and a worthwhile investment taking the guesswork out of the first few visits. Salmon start running in the Fraser in catchable numbers in June and continue into November, a very long season to say the least. During these six months the Fraser River will change considerably. The Fraser is usually very high at the start of the season, as the week's pass, the river will drop steadily exposing many gravel bars from which to fish from. Fishing the Fraser is best fished from a jet boat. There is just so much more access and many of the best spots are only available by boat. Many of the shore access spots are not available until the river drops sufficiently, usually in August. The Fraser River is blessed with all five species of Salmon. The Chinook, or King salmon, is the most sought after and the largest of all the Salmon species. Locally most anglers refer to them as Springs. Chinook are also the longest running of all the Salmon they can be caught from June though November. There are literally hundreds of different runs of Chinook salmon traveling through the Fraser during the season; because of this these fish are diverse. Chinook in the Fraser can vary from 5 pounds to over 60 pounds but a probable average would be about 23 pounds. Red meat or "Reds" are more predominate over White meat or "whites" except in the Fall, from late September on its almost all "whites" There are few Salmon any where in the world that can match the power of a fresh Fraser Chinook. These fish are silver, bright and fresh from the ocean usually only a day or two from the salt. Many Chinook will still have sea lice on them. Hooking a Chinook will often result in anglers hurrying to the boat to give chase before the beast can spool them. Sockeye salmon are the local favorites these fish are the most prized of all the salmon because of their rich dark red flesh and their abundance most years the Sockeye runs are between 10 and 15 million fish strong. Sockeye can be found in the Fraser in late June and run well into September. The Sockeye season opens on the Fraser for retention usually August first and will run between two and four weeks depending on the whims of the Department of Fisheries and Oceans. Sockeye season on the Fraser is a sight to behold. The weather is warm, the fish are in and the angler's are out...in force. Yes this is a busy time on the river but as I said before this is a big river and there are many spots to fish, not just the spots where every one else is. On a good day a angler can limit out on their two fish usually in half an hour and in many cases sooner and then play catch and release while waiting for their chance at a Chinook. Every odd year on the Fraser the pink salmon make their return in huge numbers, in 2003 the pink salmon run exceeded 26 million fish! While many anglers do tend to look down at the Pink salmon, I think that these fish are getting a bad wrap. The Pink salmon of the Fraser are one of the largest strains of Pink salmon any where in the world. Most strains of Pinks average between two and four pounds, but the Fraser pinks run between four to six pounds and fish reaching ten pounds are not uncommon. Because Pinks are so numerous, and they are also very aggressive, the action is non-stop. Anglers can expect between twenty to sixty hook-ups per day and if you combine this with light tackle or a fly rod you can't help but have a great days fishing. Pink Salmon usually start showing up around mid August but peak around the second or third week of September and also can be caught well into mid October. Chum salmon usually start showing up around mid September. These bulldogs arrive with plenty if attitude and like to bite. The Fraser River has a very strong run of Chum salmon and these fish can be caught well in to November. During the peak of the run anglers can expect continuous action. As most anglers know Chum salmon usually show up sporting a fair bit of colour and the Fraser fish are no different, how ever if an angler puts in their time most days they will be rewarded with some very bright fish and big ones to boot! Fraser Chums average about 12 pounds with a few that can go well into the mid twenties. Coho, or Silvers are the most elusive of all the salmon species of the Fraser River. Most anglers fish for Coho in the tributaries but if one is persistent Coho can be caught in the main stem of the Fraser River. Coho Salmon start showing up in late September and the majority come through in October and early November. Coho salmon run in size from about four pounds to some as big as eighteen pounds. Most of the fish caught in the Fraser are found at river mouths, backwaters, sloughs and slow riffles. These are a very sporting fish that are dynamic fighters that usually explode from the water when hooked, well worth the effort it takes to find them. Most of the Salmon fishing on the Fraser River is centered out of the city of Chilliwack, particularly if you will be fishing from a boat. Island 22 park and boat launch is the most central location to start from. Island 22 is a campground as well as a boat launch so this is a convent place to start. The Fraser River is a large swift river that usually has limited water visibility. So, even though there are no white water obstacles to avoid anglers do have to be very aware of water depths that can suddenly change when traveling up or down stream. It is not unusual to be traveling in 20 feet of water and then suddenly you are in a foot or less with little or no warning. While many anglers do use propeller driven boats Jet drives are preferable and the choice of all river guides on the Fraser River. Anglers fishing from shore do have far less options as the good spots to fish from shore are no where near as plentiful as with a boat and the numbers of anglers is greater here as well. Some of the most popular and productive bars for anglers fishing with out a boat are Peg leg bar, Gill road Bar, Herrling Island, Jones bar and the Scales bar. These fishing locations are located from Chilliwack to hope and can all be accessed without a boat. These bars usually are not available until late June or early August depending on the water levels for each season. The Fraser River and its salmon are very diverse to say the least and because of this so are the methods used to catch them. You could definitely say that the Fraser River has something for every angler. The oldest of all fishing styles for Fraser salmon would have to be Bar fishing (also known as plunking). 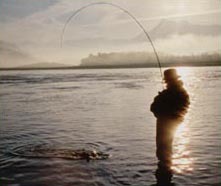 Anglers have employed this type of fishing for years, and on many rivers other than the Fraser in Canada and the U.S. Bar fishing the Fraser however has evolved to accommodate the special situations unique to this river. The tackle used for bar fishing is quite heavy because the gear literally must be anchored to the river bottom. 12 to 20 ounces of weight must be used to keep your gear in place or the swift current will carry it down stream. Directly above the weight is a spreader bar to keep the leader and weight separated. Your main line should be no less than 30-pound mono or even better a good braided line of 50-pound test. Your leader should be heavy as well 30 to 50 pound mono and about three feet long. The best bait is the good old spin n glow and that is big as well sizes 00 in a variety of metallic finishes are the most popular. Spin n glows can be fished with or with out bait and the whole rig is followed up 7/0 hook. Once your rig is cast into the river your rod is then put into a rod holder and then you sit back and enjoy the day while waiting for the strike. Rod and reel selection as you can guess by now will be on the heavy side. Rods need to be heavy enough to cast large weights and handle heavy line. A good long rod is also preferred 10 to 11 feet is the norm as this keeps more line out of the water. Spinning reels work fine but bait casters are preferred, just make sure they can hold at least 200yds of line as when you get a good Chinook on they can make some surprisingly long runs. Bar fishing is primarily used for Chinook salmon but Chums, Pinks and Coho are also taken with this technique regularly. Sockeye salmon are rarely caught while bar fishing. Bar fishing is deadly effective when the water conditions are favorable, most obvious is water clarity you will need at least two feet of visibility. The Fraser River can be quite dirty for long periods of time but usually during the season there will be opportunity to employ this fun and relaxing tactic. Bottom bouncing the Fraser is a very popular technique for Chinook, Sockeye, Chum and Pinks. Coho are also caught with this method but far less often. Bottom bouncing is effective all season long and is still very effective when the river has poor clarity. 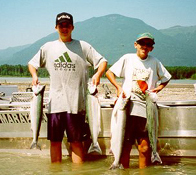 Around 1994 the department of fisheries and oceans decided to allow limited sport fishing opportunities for Sockeye salmon on the Fraser River. Previous to this 99 percent of all anglers who fished the Fraser did so bar fishing. It soon became obvious that if anglers wanted to catch sockeye with any consistency then a new method would have to be employed. While the main target initially was Sockeye salmon it soon became evident that most of the other salmon species could also be targeted using this technique. The gear for this is quite standard the usual 9 to 10 foot drift rod with ether a spinning or bait-casting reel will be fine. You will want at least 200 yards of 20-pound test mono or 30 to 40 pound test braided line would be even better. Your basic terminal rigging is simple: a standard or a three-way size 10 swivel is attached to the main line. Your weight will be between 2 and 4 ounces depending on location. Most of the regular Fraser anglers use locally made round lead weights that have a snap attached to allow for easy installation. The round shape allows the rig to sink quickly and has a great feel as it bounces along the bottom. Next is your leader run between 6 and 12 feet of 15 to 25 pound test leader, yes longer is better. Most anglers will then add a small spin n glow or a corkie around size 8 to 14 in various colors followed by a size 1 to 4/0 hook that may or may not be also dressed with yarn. Bottom bouncing is a very pro-active style of fishing; it requires the angler to be actively casting all day long but when the fish are present the effort and time spent is well worth it. This day and age Fly-fishing for trophy fish has become all the rage and the Fraser River is no exception. All five species of salmon can be targeted on a fly rod in the Fraser, how ever timing is much more critical. Water level and water clarity do play important roles in fly-fishing and for this reason I would have to say that most of the time the Fraser river should not be considered for fly fishing for salmon until at least late August or September. For most applications your standard 8 or 9 wt, 9 to 10 foot fly rod will get the job done. Your line selection should include several sink tips from slow to extra super fast. Standard deep sunk and swing techniques are the usual fare except in the backwaters where subsurface cast and retrieves are preferred. Fly selection is as diverse as there is anglers but Popsicles, Egg sucking leaches, various Prawn patterns and Muddler minnows in sizes 6 to 2/0 is a good place to start. In all honesty a whole article could be written on fly fishing the Fraser but this is just a taste of what this awesome river has to offer in the fall of the year. Fishing the Fraser River is all about timing. Depending on what species you are after and how you would like to catch them will largely determine when you should come. Chinook salmon are the Kings of the river no question about it. Chinook salmon are available all season long. The peak times for Chinook would be about July 10th to about September 15th and then October 10th to October 25th Chinook are open for one fish per day. Sockeye salmon are easily the most popular of the Fraser fish for local anglers. Their abundance and rich deep red flesh are hard to beat. The best time for Sockeye is usually the first three weeks of August. Sockeye are caught before and after this time but this is typically when the Sockeye are open for retention. When Sockeye are open anglers are permitted two fish per day. Pink salmon only run on odd numbered years, 2003,2005,2007 etc. there numbers have to be seen to be believed. These scrappy fish provide excellent sport on light spinning rods and are an absolute blast on the fly rod. Twenty to sixty fish days are the norm when the pinks are in. Pink salmon start showing up during August and run well into October but the best time is September. Pink salmon are open to retain four fish per day. Chum salmon return every season in the fall of the year. Late September we usually start to see these big boys tearing up anglers tackle. All of October and well into November is prime fishing for chums. Chum salmon are open for two fish per day. Coho Salmon also share the same timing as their big cousins the Chums. Coho are usually closed to retention until early October but then open for a two fish per day limit. Only hatchery Coho may be retained by anglers, all wild Coho must be released. Hatchery fish are identified by the absence of an adipose fin. 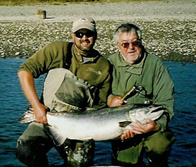 Over the past decade I have had the pleasure of guiding people from all over the world on the Fraser River and its tributaries, and while I have extensively fished in the Fraser valley for considerably longer than that it was my clients that really opened my eyes to what a truly special river this is. You see when you live so close to something so valuable you get used to it and can take it for granted. It was really an eye opener to see these people absolutely blown away by something I thought was normal. The fact is that the Fraser River is anything but normal. To have a fishery like this where the salmon runs are counted in the millions not the hundreds so near a major city (Vancouver) in this day and age is the exception and not the rule. So why then has Fraser River been so overlooked for so long? I don't really know and I guess no one can say for sure. But the next time you are planning a fishing trip to a new destination one things for sure, the Fraser River should be at the top of your list!